Radley Lakes Verdict: It’s a No! The sun is setting over Thrupp Lake. Will it be forever? On 13 October 2007, Inspector Vivian Chapman QC finally delivered his 62 page report rejecting the application by Mrs Jo Cartmell to register Thrupp and Bullfield Lakes and their immediate surroundings as a Town or Village Green under the Commons Registration Act 1965. Despite finding “overwhelming evidence” of use by the people of Abingdon, and fully acknowledging the beauty and interest residing in the area, the inspector nevertheless decided, based upon his expert interpretation of the law, that the applicant had failed to prove that the land was registrable as a Town Green. Accordingly he has recommended that Oxfordshire County Council reject the application, which, there is little doubt, they will do. RWE npower, one of the world’s largest electricity companies, will now go ahead with ruining Radley Lakes. Local campaigners are dismayed by the Inspector’s decision that the land does not qualify as Town Green. Oxfordshire County Council’s Planning and Regulation Committee will consider the Inspector’s findings at its meeting scheduled for 26th November. At the present time, there is little doubt that councillors will accept the Inspector’s recommendation and reject the application. The Inquiry and its conclusions have nothing whatsoever to with the rights and wrongs of npower’s plans. It is a verdict on whether the lakes are registrable as a Town or Village Green under the Commons Registration Act 1965, which nothing to do with planning. Had the application been successful, it would have prevented any development in the designated area. The application to register the Radley Lakes , Bullfield Lake and Thrupp Lake and the land around them, as a Town Green was made by Mrs Jo Cartmell on 19th October 2006. The registration authority, in this case, is Oxfordshire County Council. 35 witnesses gave oral evidence in support of the applicant and 3 against. A further 78 witnesses (some of whom were couples) submitted written evidence in support of the application. The evidence is overwhelming that for many years, certainly since before 1986, Thrupp and Bullfield Lakes have together formed a popular destination for trips by residents of Abingdon. They are only a short distance from the edge of Abingdon and are readily accessible on foot or by bicycle using public rights of way which are easily combined to make a short round trip. It is also possible to park a car near Sandles. There are very good views over Thrupp Lake from the BOAT running down its E bank. 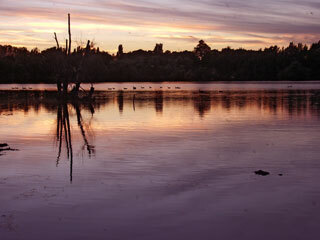 Thrupp Lake is an attractive expanse of water with interesting waterfowl. The ease of access has increased with the opening of the Sustrans route in 1999, but I find that the trip to these lakes was very popular with Abingdon residents even before 1999. Although many people doubtless confined themselves to the public rights of way running along the E and S sides of the lakes, I find that, since before 1986, a significant number of local people have left the public rights of way and walked around the sides of the two lakes. Since before 1986, it has been possible freely to enter the application land through an opening at the SE corner of the application land. From there, it is possible to walk a circuit of Bullfield Lake using the path along the isthmus to the N of the lake and the path running through the strip of land to the S of Bullfield Lake. It has also been possible to walk a circuit of Thrupp Lake by walking N or S of Bullfield Lake and then walking along the W side of Thrupp Lake , exiting through the Curtis works gate when it is open and then walking along Thrupp Lane to the N of Thrupp Lake to rejoin the E BOAT. Of course, these routes can also be walked in reverse. In view of these findings, many will find the conclusions of the Inspector’s report very hard to understand. and Andy Boddington, Leon Flexman and Basil Crowley talking to Bill Heine.